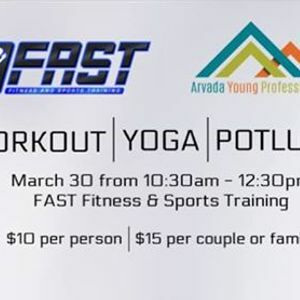 We're excited to share our first social event of the year - a group workout and potluck on March 30 from 10:30 - 12:30pm at FAST, Fitness & Sports Training. Break a sweat with a 45 minute workout followed by 30 mins of yoga. We'll celebrate our workout afterwards with a potluck, so please bring something to share! Families, significant others, friends are invited. $10 per person or $15 per couple/family. Register today by clicking the ticket link above!